Toyoko-inn opened in Busan Jungangdong! Toyoko-inn, the Japanese business hotel chain with 183 branches all over Japan has opened its branch in Jungangdong, Busan in a 23-story building. 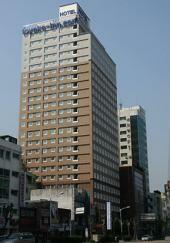 The hotel is located between Busan International Ferry Terminal and Busan station. Yongdusan Park where Busan tower is located, International Market and Jagalchi fishery market are accessible only in 5min by using a subway from Jungang-dong station, which is 5min walk from the hotel. Seomyeon where Busan Lotte Dury Free Store, Lotte Department Store and Lotte Hotel are located can be conveniently reached by Busan subway. There is also a shuttle car between Busan station where KTX departs/arrives and International Terminal. Most of the rooms used to be single rooms for business travelers when the hotel opened, the number of double rooms and twin rooms with a nice view of Busan tower and Busan bay has been increased to accommodate sightseeing tourists. To meet foreign travelers’ demands, rooms are equipped with free LAN and the hotel provides various services such as a complimentary breakfast, internet telephone (free for 3min) at the lobby and pc with broadband connection. Rooms are equipped with bathroom, toilet, telephone, TV, safe, refrigerator, kettle, hair dryer, A/C, shampoo, conditioner, etc. Guests can also use own computer connecting to free LAN in a guestroom. There is a complimentary mineral water in a refrigerator. Breakfast (7-10am) including bread, juice, salad, rice ball, coffee, etc is served at the table next to the front. There are also a vending machine, water purifier, microwave, washer, pc, fax, telephone and smoking room free to use for guests at the lobby.